When I received a phone call from Karen over at Would Like To Be asking me if I would like to take part in the Frugi 'Gift of giving' project, I immediately said 'Yes, please'. Frugi is a clothing company selling gorgeous organic ethically sourced cotton clothes for children and a few bits for grown ups too. As a company they are really involved in giving back to charities, they are part of the 1% project, and raise money through their sample sales, to date they have given a huge £130,000 away. They wanted to focus on the theme of 'Giving' this Christmas and the 'Gift of giving' project was launched. Karen is part of the Frugi family and was asked to chose another blogger to receive a surprise Frugi gift. I couldn't wait to see what surprise she had picked out for one of my girls and when it arrived I was in no way disappointed. Our parcel contained this stunningly beautiful Twirly bow dress in just the right size for Little 1, she loved it immediately and so did I. It is so her colours and perfect for her to wear this Christmas. The dress is lovely and soft with a great feel against Little 1's sensitive skin. The fabric has a lovely weight to it with the navy edged lining flowing out from under the reindeer print top layer. The back of the dress is just as gorgeous as the front with a big bow to finish the dress beautifully, poppers up the back make for quick and easy dressing too. We couldn't wait to see how twirly this dress really was and stepped out for a spin after teeming the dress with a pair of navy shoes. 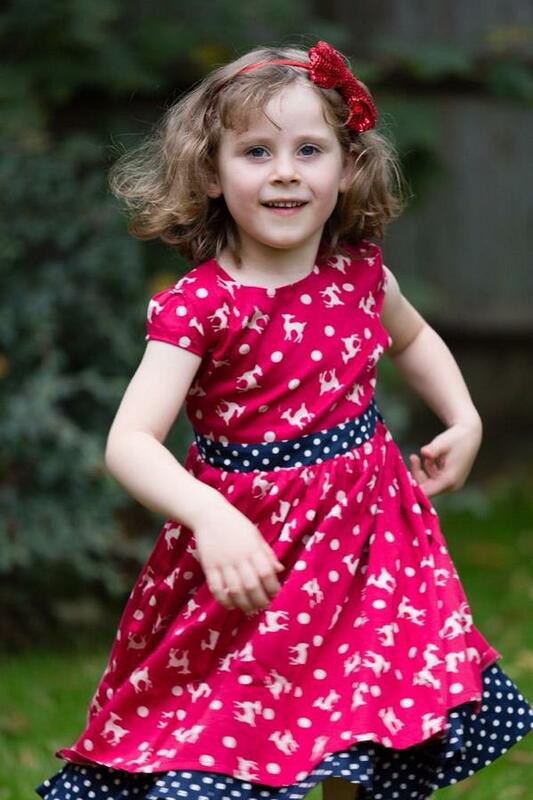 Little 1 loves to twirl and this dress definitely allowed her to do that, it falls just nicely and has a lovely fit on my little girl, she loved it so much that she didn't want to take it off! We love this dress and I can see it being the number one choice for the upcoming parties this Christmas season. It feels as though it will wash and wear well and withstand all that a partying 5 year old can throw at it. N.B We received this dress as part of the Frugi 'Gift of giving' project in return for our honest opinion of the product. Outdoor photos in this post were taken by Karen's 'husband' who remains anonymous on her blog.